This is one of the most beautiful yet simple country-houses in the area. 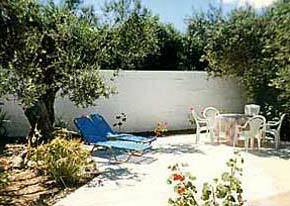 Villa Emilia sits in its own grounds surrounded by thousands of olive trees and fields of vegetables. This is natural Cretan farming countryside - there are few immediate tourist facilities and almost no signs of anything other than normal, real, down-to-earth Cretan life. 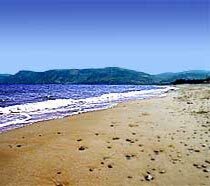 The unspoilt natural sandy beach is 10/15 minutes easy walk away (or 2 minutes drive) through lush, shady olive groves and fields which often stretch right down to the sea. 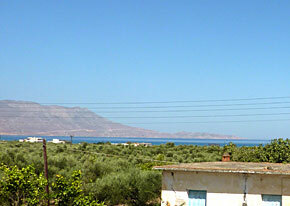 There are three tavernas on or near the six km beach - otherwise there is nothing but a patchwork of fields and the occasional house. 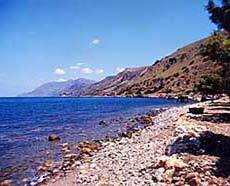 Two km along the coast, in the corner of the bay at Nopigia, the sand gives way to rocky grandeur and wonderful countryside for walking and exploring. 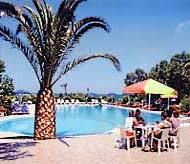 Nopigia is also home to one of the largest swimming pools and excellent Tavernas in the area. 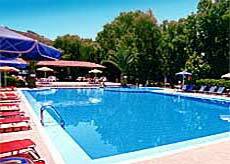 The owners are old friends of ours and everyone from Villa Emilia is welcome to use this huge pool without charge. 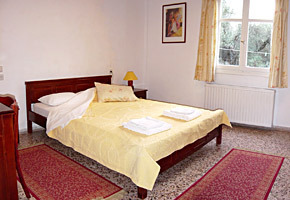 Villa Emilia was built in stages between 30 and 60 years ago. It is completely detached and entirely surrounded by its own private garden. 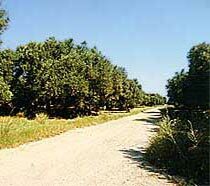 This is a gently shaded and wonderfully peaceful place, with flowers, olive and fruit trees and two huge walnut trees. From the road the driveway runs alongside the house under the trees. It would be easy to park at least six cars here - if you must! The front and sides of the house are flower gardens with trees and bushes dotted here and there, and plenty of space for you to grow your own vegetables..
At the back of the house is a huge walled patio. This spacious area is completely private and perfect for sunbathing by day and evening parties with friends gathered for dinner under the clean, clear, moonlit sky. Behind the house there are stairs up to the roof. From this terrace one can see far across the tops of the olive groves to the sea and beyond - to the entire Kissamos bay and to the mountains, stretching out into the Cretan sea towards the Cyclades Islands. Inside there are a total of six rooms plus a bathroom, which also contains an automatic washing machine. 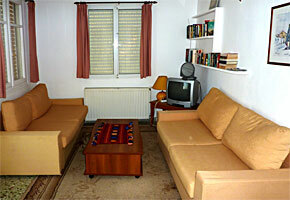 Leading from the front door is a fully furnished reception/ sitting room. Further inside is a big living/dining room/kitchen. 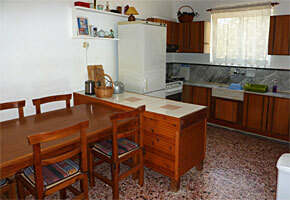 The kitchen is complete with all the equipment you would expect to find, to be able to live here on a long term basis. There are four bedrooms in all, two with double beds, one with two single beds and one with either one single bed or furnished as a small office. 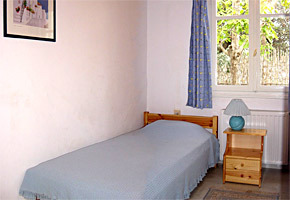 The main double bedroom has huge wall-to-wall wardrobes. 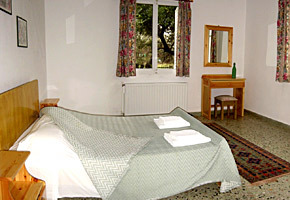 All bedrooms are fully furnished with dressing tables/mirrors as well as bedside tables etc. In addition, the sofa in the front sitting room converts into a double bed. The bathroom/WC has a bath as well as a shower attachment (unusual in water-conscious Greece where a simple shower is the norm). In summer there is constant hot water from the huge solar panels on the roof and in winter the water - and indeed the whole house - is centrally heated by an extremely efficient oil-fired heating system. This house is only available for a minimum of three months. This is NOT a tourist house. Prices vary according to length of contract and INCLUDE a fully equipped home, with all charges for gas, water, electricity, wi-fi internet and local taxes already paid. So you have no daunting commitment or set-up hassle with utility companies or the local authority and can arrive and get on with living here immediately - just bring your clothes! We have clients for short and long-term rental from all over the world and no two requirements are ever the same so do please ask for a specific quotation appropriate to your circumstances. In pictures � the village of Drapanias, the town of Kissamos-Kastelli and surrounding areas. This is a completely genuine farming and fishing area, hardly changed by the march of time or tourism despite having one of the longest natural beaches on Crete. Once a thriving community on the old main road from Chania to Kastelli, nowadays Drapanias village, whilst peacefully off the beaten track, still has local shops and Kafeneons for immediate needs. 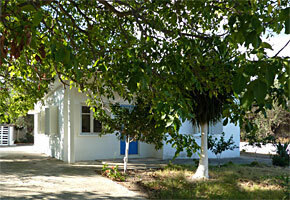 The village remains on the main bus route between Xania and Kissamos-Kastelli and is just two minutes drive from the national highway and connections for touring the entire island.